Every year, starting around the end of October and ending at the beginning of March, I embark on an absolutely fantastic display of gluttony. For nearly four straight months I’m stuffing my gullet, from Halloween candy to Thanksgiving turkey to Christmas treats to Valentine’s chocolate to birthday cake to another birthday cake (mine, then Mr. P’s). And by mid-March, I realize that my portions are all out of whack and my pants are getting tight and I’m just uncomfortable. Detox time! That happens every year. But this year’s a little different, because just yesterday a colleague came by my desk to discuss our upcoming trip... to Cancun. Granted, this is a trip for work, but there is bound to be some beach time involved. And this body, it’s not beach-ready. Especially around coworkers. So not only is my body starting to crave vegetables after this months-long junk food bender, I’ve got a real mental motivation to clean up my act. Fortunately, I found some new-to-me tools to make the switch to healthier habits much easier. Originally, I was saving these to tell you about in a March wrap-up post about my favorite things... but I can’t wait, and I have more than a few sentences to say about each of them! First of all, there’s the My Fitness Pal app. Have you heard of it? source... totally not my calorie count. But here’s what makes it so great: it is super easy to log all of this because it has practically every exercise and every food in its database, even by brand name! Seriously, the only foods I haven’t found in their database were those at a St. Louis-specific, non-chain restaurants. Even then, I could estimate from other chain restaurants, which are in the database. And there’s even a barcode scanner to help ID the food (which I’ve never used, but that’s still pretty neat.) Plus, you have a ridiculous amount of control in getting the serving size just right, which is important for a control freak like me... if I can’t make it do what I want, I won’t want to use it. source... that’s not me eating meat and potatoes for breakfast. Oh, but it gets better. As you are well aware, I cook a lot, which is good from a health standpoint... but a whole heck of a lot harder to figure calories than it is for a pre-packaged meal. This app, though, lets you input your recipes, ingredient by ingredient. (I love that part, by the way, because it shows me which parts of the recipe pack on the calories and which are basically freebies.) Then you tell it how many servings that makes, it calculates calories per serving, and bam! 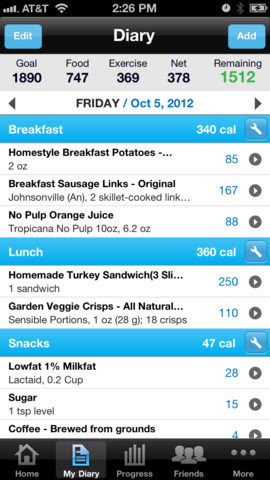 You’ve added your own custom recipes and you know exactly how many calories you just ate. 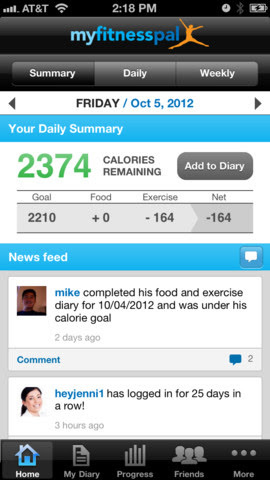 I downloaded this app for the accountability, but I fell in love it with for all the information. I had no idea how many calories I burned walking to work or how many I consume in that gin and tonic. This app isn’t just helping me be mindful, it’s helping me be smart and make more informed food choices. I know I sound like a commercial (this is totally NOT a sponsored post), and I may have moved beyond meal planning to straight-up food micromanagement, but I love it. Not only for the data overload, but because... it works. I don’t weigh myself (that’s another feature of the app I don’t use), but in the two weeks I’ve stuck with it, that uncomfortable bloat caused by four consecutive months of poor food choices is nearly gone. High five! My obsession with MyPlate’s recipe collection is mostly because my body needs it, but the fact that my favorite First Lady endorses it sure doesn’t hurt. I almost didn’t want to let you in on my little recipe secret, because hello, here’s all the recipes I’ll be featuring over the coming months. But it’s such a great collection that I had to share! My favorite is the Quick & Easy Meals board, as you might expect. I think the best part of this collection, though, is how totally accessible most of the recipes seem. For the most part, they didn’t select recipes loaded with quinoa or chia seeds. There’s an occasional kale recipe, but for the most part, the recipes use basic, familiar ingredients and follow their formula: a bit of protein, a ton of veggies, and a sensible amount of carbs. I can totally make this stuff. I just needed a super easy way to remember what healthy stuff is. So! If you, too, are emerging from a long winter of stuffing your face and looking forward to a healthier spring and summer, I hope these tools can help you too! And while I also hope that I can show you photos in a few months that demonstrate Project Beach Body has been a success... so far, I’m just happy to be feeling like a better-functioning version of myself. Thank you for sharing this! Even though I weigh less than I did pre-baby, I still JUST HAD A BABY.